Depending on the marijuana grinder you are using to break down your stash, there usually is a screen located near the bottom of the grinder that is affectionately known as the kief catcher. This little screen is responsible for capturing the sweet nectar off those green leaves, the kief, which contains high amounts of THC. The very powerful THC falls off the leaves when you grind up dank pot, and once separated, you can use the kief to enhance your nug or smoke it straight and get the best high possible from your stash. Without the kief catcher, you are simply wasting the best part of your herbs. To get a better understanding where and how the kief catcher works, you have to know why you want it in the first place. That kief is the powdery, super-fine, dust-like substance that remains after you grind down your weed. This pollen-like substance resembles a fine coating of pollen from a flower, but is the most potent substance you will ever smoke. 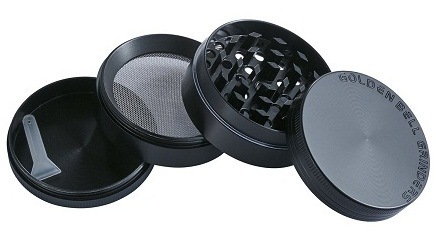 The weed/herb grinder comes in a number of different configurations. The most common herb grinders come in 2-part, 3-part, or 4-part. This is the most basic of all herb grinders. 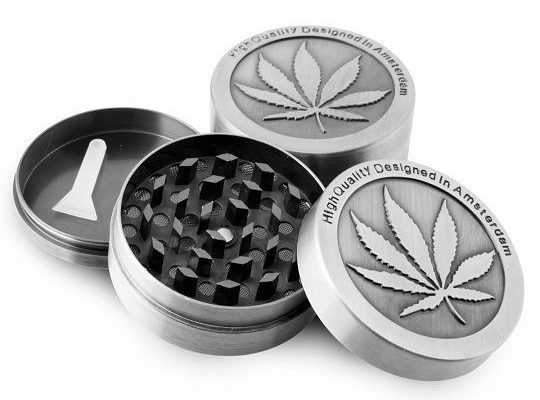 The 2-part grinder has only a bottom and a top, both containing teeth that will shred up your herb. This device is basically a shredder, so you kief has no where to go and unfortunately the best part of the stash is not being utilized. The 3-part weed grinder is a step up from basic, but it still is a bare-bones shredding device and nothing more. 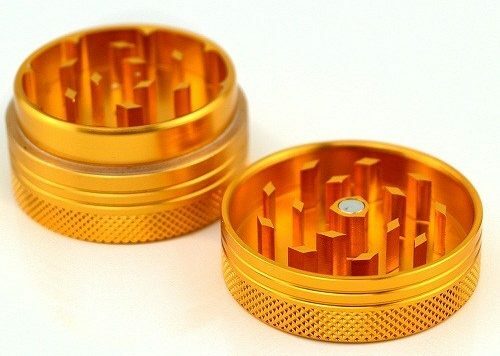 The only difference from this grinder and the 2-part is there is a “catch chamber” at the bottom that catches the ground up herb that falls through the holes in the compartment above. Basically everything winds up in the chamber, kief, buds, stems, and all. The cream of the crop, the 4-part weed grinder, comes with another compartment below the “catch Chamber” designed to catch all your kief. 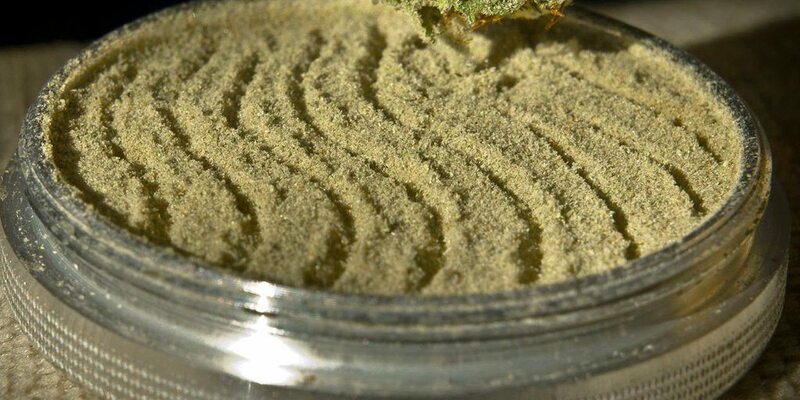 Thus, the reason this layer is called the kief catcher or pollen catcher is because it is made up of a tiny screen that will only allow the tiniest pollen-like particles to fall through and into the compartment. This is the gold nectar of the weed, and is separated from the stash like gold nuggets from a rock pile. The kief that accumulates in the bottom chamber takes time to gather. Don’t assume after your first grinding session to see a tray full of the sweet kief, it will take a few rounds to build up your collection of this most precious dust. In order to get the most kief into the bottom chamber of your weed grinder, you need to maximize your yield with a few tricks from expert stoners. These pot-heads have mastered the art of getting every little spec of kief into the holding compartment, and now you are being exposed to their secrets. If you accidentally lost your grinder or your roommate took it out and you got no grinder to grind your weed then this great article about how to grind weed without a grinder will be all you need. Whether you are budgeting your weed for the next party or considering making pressed hash, these kief catching tips will give you more materials to work with. Grounding – One tip for getting more kief when grinding is to simply turn the weed grinder upside down the first couple of turns. What this will do is make certain the weed is ground completely before it falls through the chambers. The result will be a powdery herb that compresses easily and dries fast, great for kief and bad if you plan on rolling your weed. Be sure to secure the top while upside down or your party materials will be scattered all over the floor. Using Coins – Place a coin in the center rolling tray, the herb collection chamber. Once you have successfully ground up your stash, shake your weed grinder in circular motions so the coin is sliding around and around and not banging all over the place. The coin will roll over the kief screen again and again, pushing tiny crystals through that screen when the pollen collects below. Be sure to clean that coin with a drop of dish soap to remove oils from fingers or the kief will wind up sticking to the coin instead of being pushed down through the screen. Tapping the Grinder – To separate the valuable kief from the screen, tap the grinder on a flat surface a couple times. That blunt force to the grinder will loosen the pollen from the screen and drop it right down to the collection chamber where you have access to it. Tapping the grinder after each session also releases any trapped nectar near the lip of the grinder that over time could harden and make it more challenging to open or close this device. So there you have it, everything you needed to know about gathering that potent THC by way of a kief catcher. Whether you are smoking that bowl of pure kief or using it to sprinkle on top of the stash in your bowl, you now can easily gather this delicacy and transform your next smoking event. Your 420 smokers will think you stumbled upon the richest source of sweet nectar this side of the Rio Grand. That little screen will turn you into a weed smoking legend in your own mind! Make the small investment in your own weed grinder with a kief catcher and take advantage of accessing the most potent part of the entire bud. This is that one investment that will pay huge returns for many years to come.